Cats Protection helps around 200,000 cats and kittens every year but we would not be able to make such a difference without the dedication of our volunteers. We have over 10,000 volunteers across the country helping out in a variety of roles, from fostering cats until they find their forever homes to manning the tills in our charity shops. 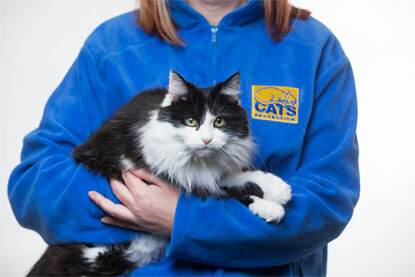 We’re always looking for more people to join our team, so whether you can spare a couple of hours or a lot more, search for the available roles near you on the Cats Protection website. Everyone who volunteers with Cats Protection has one important thing in common…they love cats! By joining our team you’ll meet lots of like-minded cat lovers who share your passion for moggies, and you might just make some new life-long friends. We have a wide variety of roles available, so whether you want to put your existing skills to good use or would prefer to take on a new challenge, there is an opportunity for you. You could care for the cats before they get rehomed, raise funds by organising local collections or events, or even spruce up our charity shop window displays to entice shoppers…the possibilities are endless! Recent research carried out by Cats Protection and the Mental Health Foundation found that 87% of people who owned a cat said it had a positive impact on their wellbeing. Volunteering with cats can also be a fantastic boost for your mental health, as one of our cat care volunteers explains here. Whether you’re directly helping to care for unwanted cats, or supporting our work in one of our many other roles, the time and skills you give will make a real difference to moggies across the UK. Without our team of volunteers, we wouldn’t be able to work towards our vision of a world where every cat is treated with kindness and an understanding of its needs. No matter what role you choose to do, we will make sure you get all the training and equipment you need to maximise the use of your generously donated time. We also have a range of online courses you can take, covering topics on cat welfare as well as more role specific advice, to help you develop your own knowledge and skills. We value all of our dedicated volunteers so you can rest assured that the time and expertise you bring to Cats Protection won’t go unrecognised! What should and shouldn’t I be feeding my cat? Is it ok to kiss my cat? Is the cat I've found a stray or feral?